Pity the fortunate who live where the seasons don’t include wind driven sleet that slices through your clothing and leaves your bones quaking from a chill that last for months. Those poor fortunates never experience the heights of joy we hardies do when greeted finally by the renewal of warm weather. No, we’re able to celebrate the “changing of the wine” in true spirit. We move to white wines. Crisp wines. Wines of joy and cleanliness and youth that celebrate the season’s promise of variety. Wines we can enjoy outdoors. Wines that pair so perfectly with many of the lighter meals enjoyed in warmer months. Rias Baixas is home to these wines. A region in Northwest Spain, Rias Baixas is hillsides of hard granite beneath a top soil of mineral-rich clay, silt and gravel. With abundant sunshine, but a cool maritime climate, the area’s five sub-regions, while unique, share in producing aromatic wines of mouthwatering acidity. These wines are a joy for both the nose and the palate and bring out the best in summer food pairing. Over 99% of all wine produced here is white. Twelve grape varieties are permitted, but the most well-known (and produced) is Albarino. It accounts for 90% of all plantings. 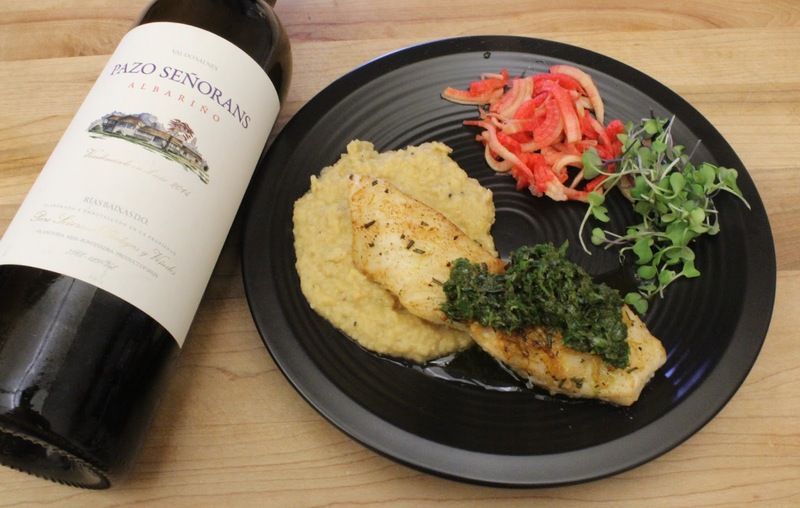 Thinking you know Albarino is like thinking you know a vegetable because you’ve tasted it. But just as the same vegetable from a different country offers a different experience, Albarino from Rias Baixas offer a unique taste and sensory experience. too the versatility of Albarino. the five sub-regions within Rias Baixas will contribute its own characteristic. And winemakers will do the rest: Many now favor fermenting with wild yeasts. Some will ferment and/or age – or age some portion – of the wine in wood. Some will extend contact with the lees (spent yeast cells) making for a rounder texture and enhanced flavor. Others may allow some malolactic fermentation. Any of these techniques may be used, or used in combination, wholly or in part to make each Albarino unique. What is universal is the characteristic that has made Albarino from Rias Baixas the standard by which all others are judged. CONDES DE ALBAREI 2014: Fermented with wild yeasts. Nose is more ripe, more melon with tastes of kiwi and melon. Not sure if there was any malolactic. No (or very short) skin contact. Another example of the freshness of Albarino. (Alc. 12%). SRP $15. PAZO SAN MAURO 2014: From further inland and south, this wine does not rest on its lees for any length, but develops color from six hours of skin contact. Aromas of apricot and peaches. Rich, ripe and rounded softly with notes of orange blossom. Flavors of jasmine, peach and minerality. (Alc. 12.5%). SRP $17. PAZO DE SENORANS 2015: O.K. Time out. 2015 was a great year, I mean terrific, for Albarino in the Rias Baixas. Consider that when I tell you I so enjoyed the floral nose and rich creaminess of this wine. No malolactic, but 5 months of lees aging can account for the rounded creamy mouthfeel. Jill points out the aroma of beer foam in the nose. I’m very suggestive, but now that she mentions it, I must agree, and I love it. (Alc. 12.5%). SRP $25. PACO & LOLA 2014: 15% Malolactic Fermentation, three months less contact, the nose is delicate but artful with some herbaceous notes, then lemon-balm and jasmine with fruit notes developing as the wine airs in the glass. Flavor of lavender and apple that is mellow and absolutely delicious. As with all Albarino, this too is dry but with fruit characteristics in balance like a Flying Wallenda. (Alc. 12.5%). ARP $22. BODEGA VEIGA NAUM 2015: (For my palate) a different approach, but one that works successfully on successive sips. Detecting some chamomile (?) which is different – or could be attributed to the various small plates I’ve been tasting. Really should taste this again, and separately, to be fair. (Alc. 12.4%). SRP $15. MARTIN CODAX 2014: What you may be thinking of when you think of Albarino. Delicate aromas of lime with white floral notes that carry into the taste. All steel for freshness, 40% Malolactic Fermentation to round it all out. (Alc. 12%). SRP $16.99. BODEGAS LA CANA 2014: A standby, I’ve enjoyed it several times. Available at most retail outlets. Native yeasts. Eight months on the lees make it gentle yet naturally peachy with mineral notes. (Alc. 12.5%). SRP $17.99. ALTOS DE TORONA 2015: Not just a 2015, but a blend of Albarino, Loureiro and Caino Blanco. Lots of lavender and honeysuckle.(Alc. 12.5%). SRP $16-$20. Albarino and Rias Baixas: a grape and a region (D.O.) that, coming together, make for a perfect storm of wines with unique character; a sense of place and joyous wine that is food friendly and celebratory of the season with prices that are budget friendly. What I particularly appreciate is the diversity within the same varietal and region of Rias Biaxas that respects any particular preference you may have for that moment. Wines that are softer, more delicate, less acidic or more so. Wines so perfectly complimenting a plate of appetizers, wines enjoyable on their own under a patio umbrella with cooling breezes on summer days and blue skies accented with puffy white clouds. But throughout it all is the common ancestry of fresh, light-medium bodied wine, with alcohol addresses only in the 12 neighborhood that are refreshing and crisp and just so enjoyable. Albarino is fast gaining popularity in the United States. A thick skinned grape that makes for fresh, fruity, but dry wines with luscious aromas and cleansing acidity that is so refreshing. Wine Mizer advice? Try several. Invite some friends and have a “blind tasting” with bottles in numbered bags Be prepared and have on hand some appetizers that can be served at room temperature or chilled and enjoy the gifts of spring and summer and the Rias Biaxas. You may like them all, but you’re sure to pick a favorite. Follow Wine Mizer on Face Book for mini wine reviews, recipes, industry news and fun facts.